VLC is one of the most widely used media players. It was one of the first open source media players to get encrypted DVD playback capability, and now, it looks like the time has come for Blu-ray playback capability also. 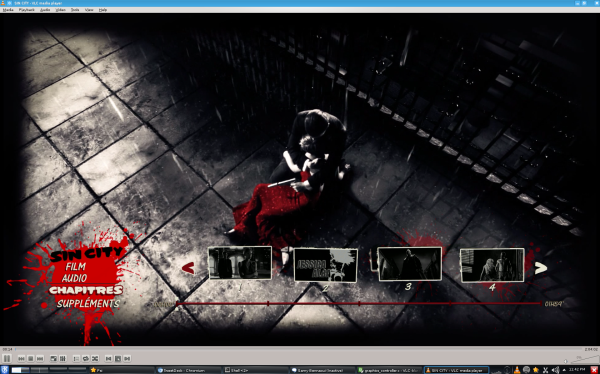 Playback of unencrypted Blu-ray ISOs and folder structures has been possible without menus since VLC 1.2. VLC also has a GPLed open source library for the implementation of the AACS specifications. From the end-user's perspective, the big missing piece of the puzzle was the AACS keys database and how to get it integrated with the VLC installation. A simple Google search was enough to reveal the key (pun intended). Audio codecs: There are no open source DTS-HD decoders available. VLC will only decode the Dolby Digital / Dolby TrueHD / LPCM / core DTS tracks in the audio stream. HD audio bitstreaming is also not currently supported. PiP features: There is no support for Blu-ray Picture-in-Picture (PiP) features yet, but this should be possible considering that the VLM already supports generation of PiP output. BD-Live: It can be safely said that VLC will probably never get BD-Live features which require BDA licensing. That said, I am not really sure BD-Live features are actually beneficial to the consumers in any way (I would love to hear feedback from readers on this). Menu functionality: This is probably the most requested feature when one analyzes Blu-ray playback support. Fortunately, a recent tweet from a VLC developer indicates that a lot of progress has been made towards this functionality. It should get integrated into the main branch in time for the release of VLC 2.1 / 3.0. We are keeping a close watch on the development of this feature for VLC. The AACS keys will never be part of the official VLC releases (since it enables copy protection circumvention), but open source support for Blu-ray playback is bound to be a boost for the format amongst the consumers (though the licensing entities are going to fret the loss of revenue). If VLC gets full menu support along with HD audio bitstreaming for unprotected Blu-ray ISOs, that will be a huge step forward for the Blu-ray format. I happened to buy a BluRay drive for my PCH C-200 just 2 weeks ago and since then I've "improved" my collection of some hundreds DVDs with the presence of 12 BluRay movies, none of which happens to play on the PCH at the moment. Bummer! Wholeheartedly agree with you! DRM only serves to handicap the honest consumers. Hollywood seriously thinks its current business model will work in the Internet age. I think they are in for a rude surprise as the years go by (they shut down one MegaUpload, a few others will spring up in Russia or elsewhere / the P2P and Usenet scene will thrive on). They should adapt to newer methods of distribution and realize that the amount they are charging for movies (in theaters or on Blu-ray discs) doesn't reflect the true value.